Old Town is a historic and affluent area, home to many of Chicago’s most beautiful old Victorian-era buildings. One of only 7 churches to service the Great Chicago Fire is here, and its said you must be able to hear the bells from St. Michael’s Church to truly be in Old Town. Old Town is generally accepted to be the area between North Avenue, Division, Clark Street, and Clybourn, and it is in both the Lincoln Park and Near North Side community areas of Chicago. The main street in Old Town is Wells. On Wells between North and Division streets, many boutique shops, independent restaurants, and nightlife options keep visitors and residents entertained all throughout the year. Second City and Zanies are here, making Old Town a popular destination for comedy. In the summer, the Old Town Art Festival draws a great crowd of people visiting the neighborhood and enjoying all that Old Town has to offer. Brownstones, and greystones fill the tree-lined streets, and give the neighborhood an unmistakable charm. 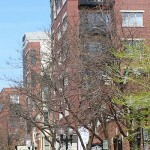 Both buyers and renters will find opportunity here in one of Chicago’s most desirable neighborhoods. The CTA Brown Line serves the Old Town neighborhood at the Sedgwick stop. Lake Shore Drive is easily accessible, and many busy bus routes go through the area as well, including the #72 (North Avenue).